Okay, we’re back with part two of The Cast Iron Chronicles! This weekend I took a good long crack at the pan, in total spanning approximately 3 episodes of Criminal Minds. 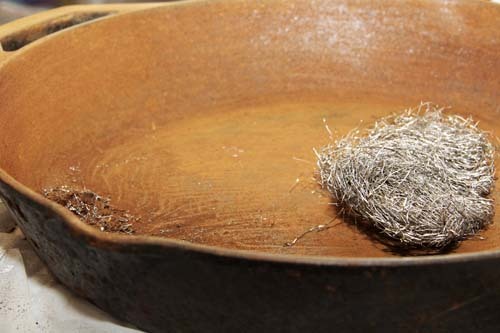 My first step was to knock the gunk and as much rust as possible off with steel wool. Now, I know what you’re thinking. 1) Why didn’t I just use an electric dohickey with a sanding attachment (I know for a fact that the Capt’n is thinking that as he send me an email suggesting that I attack it that way) or 2) Why don’t I just cover it in oven cleaner and let it soak overnight? So for one- we don’t have any electric dohickeys, and I figured that’s why I have hands. And arms. I know it would be faster to use power tools, but I’ve got plenty of Criminal Minds in my Netflix queue and all winter to work on this pan. I’m in no rush. 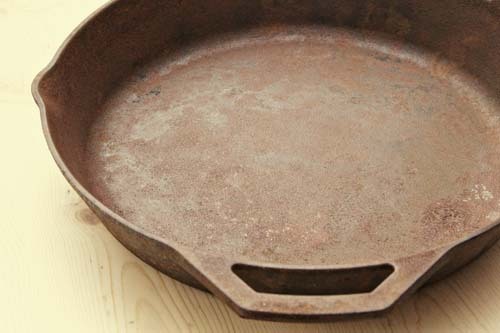 As for the oven cleaner- because cast iron is such a porous material I don’t want to use anything on this pan that I wouldn’t squirt on top of my eggs. 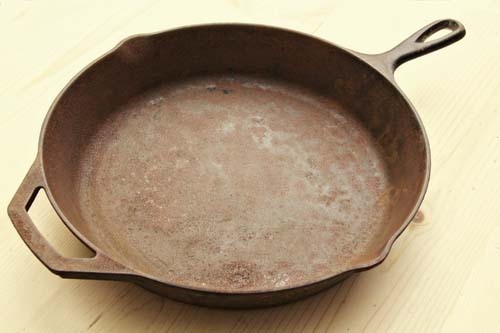 Cast iron has a tendency to retain the flavor of things and I don’t care to take the risk with oven cleaner, even if it would probably burn off later in the seasoning process. I’m very careful with all my cast iron, I never use soap to clean them, only ever hot water. According to my Uncle Everett, Sybil only ever used salt to clean her cast iron, no water at all. So, no harsh chemicals during this process. Just good old fashioned scrubbing. I worked on the pan for about 2 1/2 hours. I removed all the pieces of debris and a large amount of the rust. 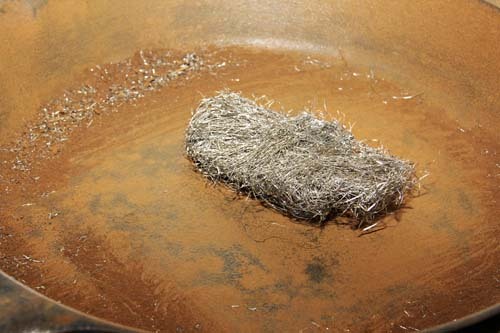 My plan is to continue with the steel wool and then transition to the coarse sand paper as needed. I’m already beginning to see through the rust, there’s a light at the end of the tunnel! I’m so glad to hear that y’all are interested in this process, I am personally loving it. There’s nothing like sanding the hell out of a piece of metal to take your mind off of the stresses of daily life. My posting schedule for this series will be a little behind the actual work I’m doing, so if you’d like to stay up to date check twitter and instagram (user: biscuitsandsuch). Not an iPhone user? Webstagram or Flickr will have the photos! I didn’t know you could use a doohickey to clean the skillet. Personally, it looks pretty good in this last photo. What would happen if you oiled with Mineral Oil really good and maybe put in a 200° oven for the day? Then pour salt into the pan and just scrub around with that. Then wipe with the oil again. See what happens overnight. In any event, happy cleaning. I have been thinking of you the past week every time I use my iron skillets. I don’t believe I take better care of anything else than I do my grandmother’s ironware. You know, doohickeys are so useful! It’s pretty close, I’ve just completed another round of sanding and I think my next step is going to be to season it with vegetable oil. My dad’s advice for the first seasoning was to fill ‘er up with oil and “burn the bejesus out of it.” So that’s the plan for this weekend!